Seoul Mayor Park Won-soon on Saturday pledged to completely eliminate the business of dog meat in South Korea’s capital. “Once dog-butchering businesses are completely removed soon, I plan to make a declaration,” he said in a meeting with an audience after watching animated film “The Underdog” at a local cinema. Park promised to “put pressure” in various ways to shut down the few remaining dog meat shops in Seoul after watching the Korean film about the journey of abandoned dogs to find their utopia, which was released Jan. 16. Seoul previously had many dog farms and dog meat shops -- near Cheongnyang-ni, for example. 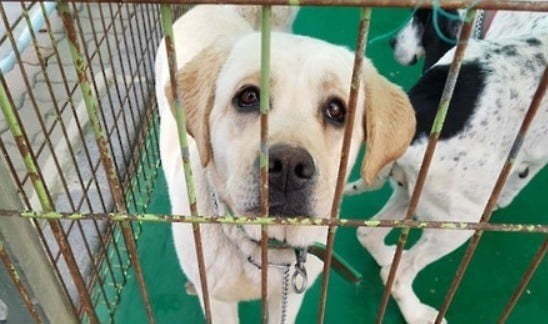 As of 2017, five dog meat businesses were registered to operate at Gyeongdong Market, one of the country’s largest herbal medicine markets, in the district of Dongdaemun. Only three of them reportedly sell dog meat, while the other two slaughter and sell dogs. “I thought that it would be important to make the world peaceful, safe and welfare-friendly in the eyes of dogs as everyone is an enemy and everything death (for animals in the film),” the human rights lawyer-turned-mayor said. In Seoul, the number of homeless pets stood at 8,630 as of 2017. Only 2,114 of them had been reclaimed by their owners and 2,591 were adopted. Some 3,740 died at a shelter or were euthanized after a 10-day notice period.